Now, I’m no graphic designer. I can pretend, from time to time, that I am. 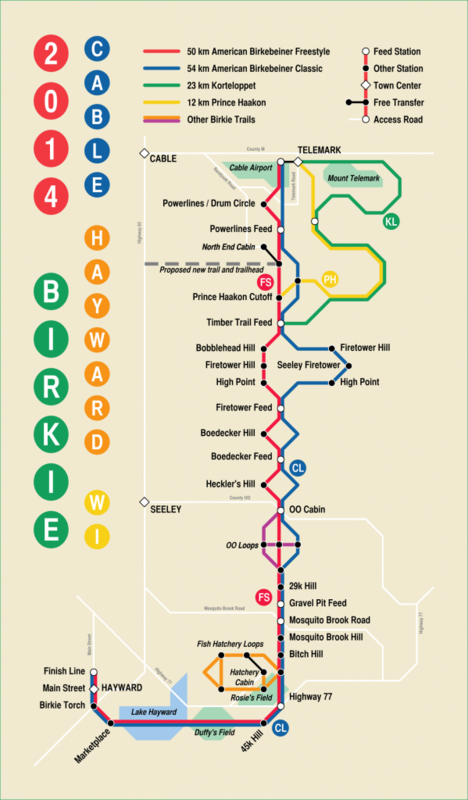 Like when I take the Birkie Trail and decide to reimagine it as a Subway-style map. This has the third iteration (the others are below), which is a much better and more complete version. I’ve been working on trail maps in the White Mountains in New Hampshire here and took a bunch of lessons learned from those in to this version. It has “2014 Birkie” because I am considering submitting it, or something similar, to the Birkie for their (wet? frozen? yeah, frozen) t-shirt contest. Click either for a larger version. And comments are of course appreciated. A nerd indeed, and an East coast subway-riding nerd to boot. But, kinda like it!